This blog post looks at an historic event that took place in the Stour Estuary at the end of World War One, and also a commemoration of the Kindertransport journeys made by children in World War Two. 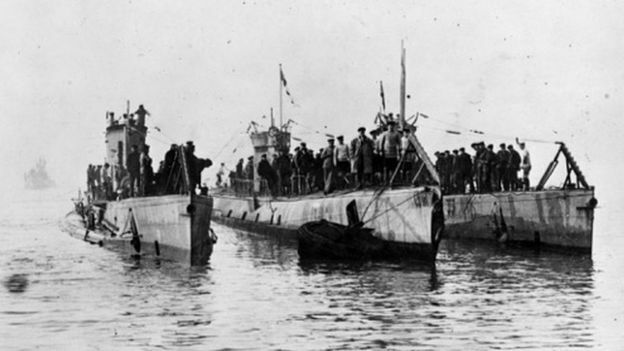 In November 2018 over 168 German U-Boats and support vessels were escorted along the River Stour by British ships. 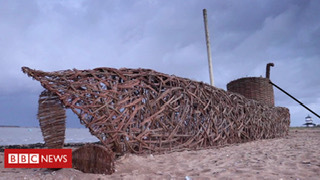 To commemorate the mass surrender of Germany’s submarines on the Essex coast at the end of World War One, a model U-boat made of willow has been created and now sits on Dovercourt Beach. To read about this chapter in the history of the Stour Estuary click here. A Thousand Kisses: The weekend of 1st/2nd December marks the 80th anniversary of the arrival of the first Kindertransport in Harwich in 1938. Between December 1938 and May 1940 almost 10,000 unaccompanied mostly Jewish children were brought to Britain from Germany, Austria, Czechoslovakia and Poland in what became known as the Kindertransports. An exhibition telling the story of the Kindertransports through the experiences of eight children will be on display at the Harwich International Terminal (adjacent to the berths where the children’s boats docked) from 24 November, and then at the Harwich Mayflower Heritage Centre from 1st to 7th December.